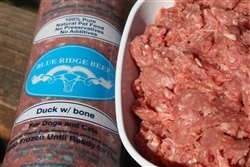 Blue Ridge Beef: Duck With Bone For Dogs And Cats. Ingredients: Ground Duck, Ground Duck Bone. (No Organ Meats) Crude Protein (min) 17% Crude Fat (min) 3% Crude Fiber (max) 1% Moisture (max) 70% Duck is a highly nutritious and a tasty choice for your pet. The raw meat is a good source of high quality protein, vitamins A, B3 and C. Minerals include iron, selenium and calcium. Duck contains a well-balanced array of amino acids, but is also high in iron, phosphorus, zinc, copper, thiamin, riboflavin, niacin, and vitamins B6 and B12, Duck is “a great protein source for pets with protein allergies,” it also works well for dogs who suffer from inflammatory conditions.